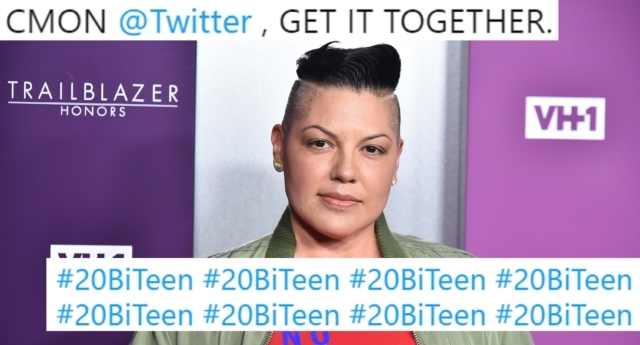 Sara Ramirez has hit out at Twitter for apparently blocking users who search #20BiTeen from seeing results in the photos, videos, news or broadcasts categories. The Madam Secretary actress, who came out as bisexual in 2016, tweeted on Wednesday (February 6): “CMON @Twitter , GET IT TOGETHER. It’s #20BiTeen and we’re gonna keep at it until you fix this issue. “Cmon #Bi+ #Bisexual #Pansexual #Fluid #NonMonosexual #Queer folk!! If we can embrace gender fluidity in our fam, then you best believe we can embrace our fluid sexual orientations,” she added. Ramirez, who made her name playing bisexual surgeon Callie Torres on Grey’s Anatomy, was responding to the revelation first reported on Tuesday (February 5) by bisexual publication Larker Anthology. Replying directly to this post, Ramirez simply wrote the hashtag “#20BiTeen” a total of 28 times. A Twitter spokesperson told PinkNews: “A recent back-end issue involving #20BiTeen meant the hashtag was not auto-populating with videos and photos. Despite Twitter’s assurance, tweets were still not showing up in the videos, photos, news and broadcasts categories at the time of publication, more than two days since Larker Anthology first flagged the issue. Twitter has limited bisexual content before. In 2017, Twitter users were unable to view certain results categories for the #bisexual hashtag, such as photos. Twitter eventually apologised and pledged to fix the issue, but many users remained angry about the perceived slight. Ramirez was not the only one to complain about users’ limited access to #20BiTeen search results. Robyn Ochs, editor of American publication Bi Women Quarterly, referred to 2017’s block when she wrote: “Oh, come on, Twitter! Again? Really?!! !